How the Heck am I in the Running for Top Blog of 2012?? So you have probably figured out by now that I was nominated for Top Personal Finance Blog of 2012. 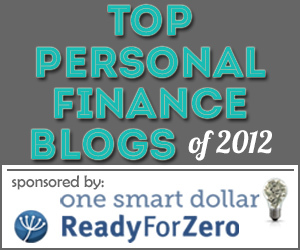 To honor the top personal finance blog, One Smart Dollar and ReadyForZero have teamed to host the contest. There are approximately 75 great blogs on this list, and voting started last week. Is my blog actually a personal finance blog??? How can I be legit having only blogged since November of 2012?? Have I helped anyone with their finances? The answer is…well…kind of…I think. As my loyal readers know, I started a journey to overhaul my financial life a little over a year ago. I took some pretty radical steps to sell my stuff, get rid of clutter, create a budget, and go to a cash-only envelope system instead of using debit and credit cards. I started writing about personal finance (and I will continue to write about it) but it won’t be my only focus. You see, what happened is that my freedom from debt has opened the door for me to contemplate other aspects of my life that I can also change. I do believe that cleaning up my finances was, indeed, the beginning of an important transformation for me. Many of you have emailed me directly to share stories of how this blog has inspired you to overhaul your finances, clear out clutter, or start a variety of new habits. To know that this blog has affected even one person in a positive manner is really incredible; 4 months ago I didn’t even write!! I am humbled that I am anywhere near the top of this list of great bloggers. Thank you all so much for voting for me. If you haven’t yet, I would very much appreciate your vote! I am not in it for the prizes; they will be given away! It simply feels good to know that you have been reading, and that maybe I have been helping. Thanks, as always, for being a reader.